Where were you during the Vietnam Era? 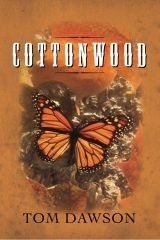 I just read the newly-released book Cottonwood; a satisfying read on many levels. Author Tom Dawson effectively crafts a story of two men who served together during one of our country’s most painful periods, the Vietnam era. The ties that bind them are their war experiences; they become life long buddies. The author intertwines the culture of the ‘Nam era” into the storyline, which filled me with nostalgic images of my own, as a person whose adolescence came during the late nineteen sixties and seventies. I could also relate, on a certain level, to some of the frustrations and attitudes that the main characters, Tom and Sam, carry about today’s technological era. As a woman, I appreciated how through good dialogue, the author showed that the two comrades, Tom and Sam, communicate differently. The truthfulness with which Dawson writes about the issue of men and aging was refreshing and honest. It is a story I didn’t anticipate liking but I really look forward to reading more from this author. To read more about Tom Dawson, the author and war correspondent, follow this link. http://bit.ly/Ng0Srt. Don’t miss out on his blog and comic art, he calls “Pieces” on his website. This blog brought to you by Sue Batton Leonard, author of Gift of a Lifetime: Finding Fulfilling Things in the Unexpected and www.CornerstoneFulfillmentService.com. It was great to meet the author yesterday. Thank you for all you do to promote our local authors! Cottonwood is a really great read. Again, another book that I thought only men would appreciate but, I am a big fan of this book as a women. Wonderful story and there is more coming from this author!